I don't have much to report this week. and this is my favorite color combination. I am knitting with Berroco Vintage Yarn, which is a joy to work with. Things are moving along well, I am more than halfway done. I will also share a picture of the gift I made for my recently married niece. it looks better in person, and the newly married couple loved it. Oh, wow, Debbie! I LOVE the gift; so original and beautiful! thanks sally, i made one for chuck and i, i always smile when i walk past and look at it!! this niece is my goddaughter and a very special girl!! and i love the guy she choose to spend her life with!! 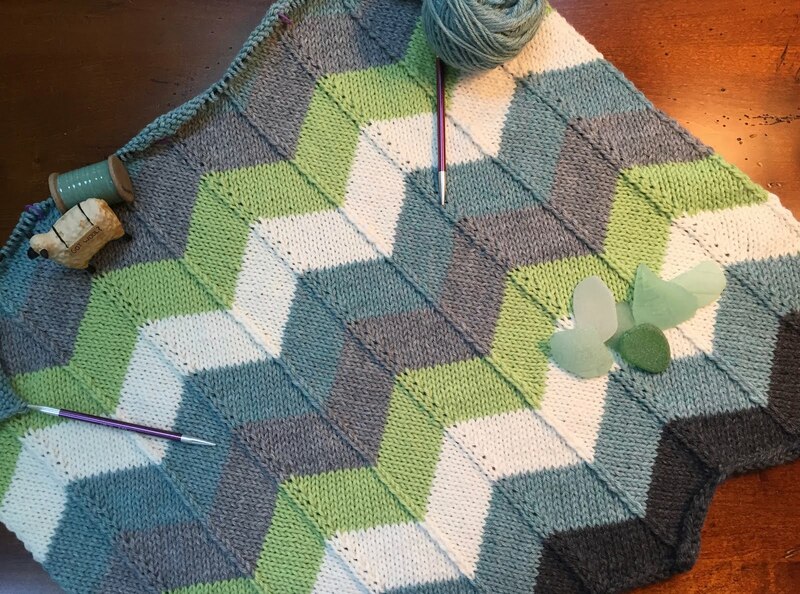 Hello, your baby blanket is pretty. I love the picture you made from the beach items. Very cute. Enjoy your day! The blanket is so beautiful! I love the patch work and colors used for the blanket. Thanks for the share, have a fantastic rest of your day. Keep up the posts! Oh Debbie! Your wedding gift is gorgeous!!! You could easily sell those! I know this one is filled with lot's of love. The shadow box must have been very welcomed for all its beach treasures, but more importantly that it came from you and your wonderful artistic eye for putting it together. Love the colors in the blanket too. So very pretty! Both projects are perfect Debbie! Sea glass with a purpose! Why, of course the newly married couple loved their wedding gift; it is beautiful. Fabulous that each piece was collected by you whilst walking along the beach. 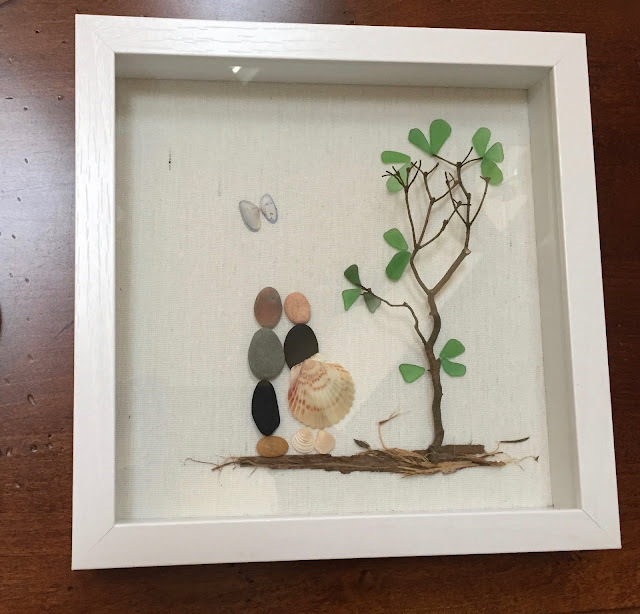 Love your inspired and creative shadow box of the couple in love.....love that sweet shell dress. =) Oh.....and of course your baby blanket is lovely as well....that goes without saying. How cute is that!????????? I LOVE IT!!!!!!!!! Wow, Debbie this shadowbox is lovely! Whaat a perfect personal gift for your niece. I love it. Of course, your blanket is beautiful and you are amzing. very inveetive Deie and am sure they wil treasure it for ever. You are a pro with that pattern, pretty soon you will be able to do it in your sleep! Wow that shadowbox you made is just Amazing, I can only imagine how much it meant to them to know that you collected all these wonderful goodies from the local area and then made a very special scene just for them, Awesome gift! The shadow box is quite delightful. Welcome, my name is Debbie, I am a 60 year old woman, married 40 years to the love of my life. I have 2 grown sons, a darling husband and a beautiful home at the Jersey Shore. I started this blog to document my daily adventures, to share my recipes, both old and new and just about anything else that tickles my fancy. I have an unhealthy obsession with knitting, my camera, gardening, scrapbooking and potatoes. I was diagnosed with Multiple Sclerosis in March 2003, the big bump in my road. From Wildflowers to Garden Flowers - We are HOME! DIY Floating Corner Shelves in Our Kitchen – All the Details!